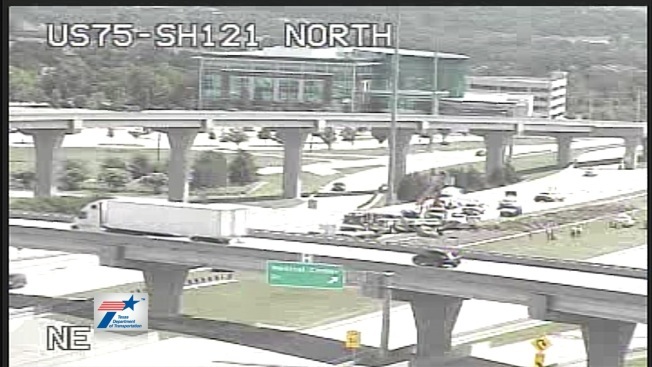 A crash at SH 121 and US 75 closes all but one of the southbound lanes of the SRT Monday, June 18, 2018. Several lanes of the Sam Rayburn Tollway were closed Monday morning near U.S. 75 after a crash involving a dump truck and a sedan, troopers say. According to Lonny Haschel with the Texas Department of Public Safety, state troopers were called to a crash along the Sam Rayburn Tollway at about 9:45 a.m. after a dump truck overturned on the highway. Haschel said investigators learned a black sedan crossed in front of the truck, causing the truck's driver to take evasive action and overturn. The sedan also hit the truck and a retaining wall. Both drivers were transported to Medical City Hospital in McKinney with unspecified injuries. All lanes were reopened sometime early Monday afternoon.